This is part 4 of our instructional series of how to assemble a racing drone. 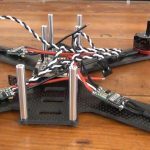 In this series, we are building a Lisam 210 frame and in this article, we show you how to figure out which wires go where when hooking up all the electronics bits that make your quadcopter fly. Check out the introduction post for more information about the series. In addition to these components, you’ll need a few spare parts to complete this section of the build. Some may not be required depending on the specific flight controller / PDB combinations you use. When you look at your flight controller, you’ll notice that it either has rows upon rows of pin holes or several side connectors – or a mixture of both. Fortunately for us miniquad pilots – only a few of these connectors are actually going to be used. The trick is figuring out which ones you need to hook up. The power and ground wires are how your flight controller gets power. 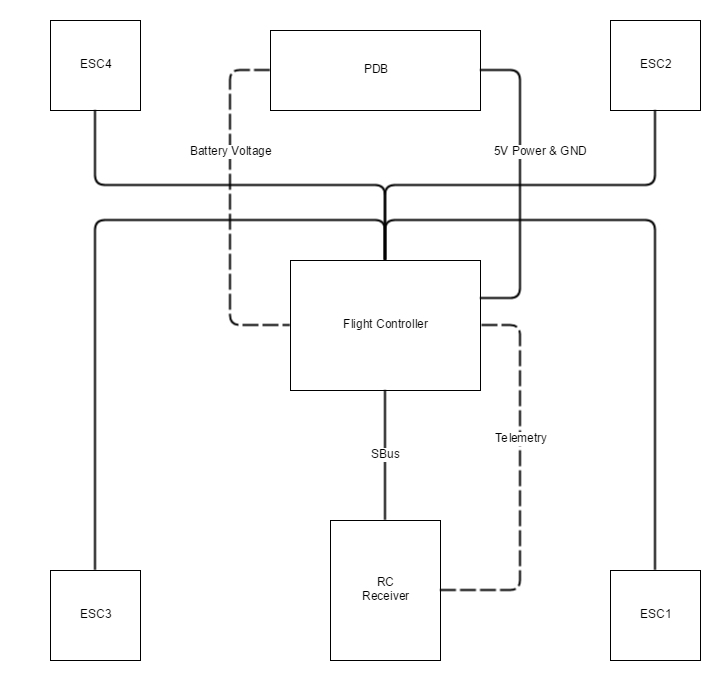 Most flight controllers run off of 5V power provided from the PDB. Some can handle a direct connection to the battery – check your manual. PWM connections are used to allow your flight controller to communicate with your ESCs. Each ESC needs to be connected to the flight controller with one signal wire – usually white or yellow, and one ground wire – usually black. PWM connections will also often have a red power wire, which rarely needs to be connected. Most flight controllers have a bank of 8 PWM connections available – allowing you to fly with up to 8 motors in tandem. 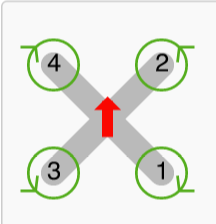 You will only use the first four for your quadcopter. Think of UART like a USB port on your flight controller. It is a standardized communication protocol which allows you to plug in peripheral devices which can add functionality to your quadcopter. Some of these devices, like the RC Receiver, are required for flight. Others, like GPS, telemetry or an OSD feed are simply nice-to-haves. All flight controllers have at least 2 UART ports, while F3 flight controllers will generally have 3. Ground: This is a basic wire that provides an electrical ground reference between two parts. It must always be plugged into the ground port on each device. Power: This wire can feed power from one component to another. You do not need to connect this wire for the UART to work. It is required to power external accessories, like your RC RX, though. UART power lines can be voltage drivers that send power to other components or voltage receivers that receive power from other components. Your flight controller is likely the only voltage driver in your circuit. If you connect this line, make sure that the voltage sent from the driving component (often the FC) is within the specs of the receiving component. The FC will most often send 5V through its power line – but you should check this against your manual. TX: The “TX” or transmit line of a UART port is the wire which the device uses to send data out to whatever it is connected to. It must be connected to the RX port on the other device. RX: The “RX” or receive line of a UART port is the wire which the device uses to receive data in from whatever it is connected to. It must be connected to the TX port on the other device. You do not need to plug in both the RX and TX wires for each UART connection. For example, when hooking up your RC Receiver, you only need to have data flow from your RC Receiver (TX) to the Flight Controller (RX). Plugging in the other wire won’t hurt anything, but it is not necessary. Now that you understand the connections you need to be making to your flight controller, you are probably starting to figure out what some of the text on the flight controller itself means. For example, on the SPRacingF3 flight controller on the left, you’ll see labeled ports for “USUART” in the top of the picture – these are your UART ports. In the bottom of the picture, you’ll see a row of 8 pin slots which are the PWM receivers ports. Even if you think you understand where to start plugging wires in, you should consult the manual for your flight controller. 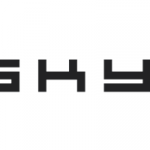 This will clearly spell out the location and purpose of each wire or connection coming out of your flight controller. You can find the manual for the SPRacingF3 FC we will be using in this build here. From this point on, we’re going to walk you through the installation process we followed for our Lisam 210 build. Please note that the order of operations here is not particularly important – you can mix and match the instructions that follows as you see fit. It only matters that you get it all done before you plug your quadcopter in the first time! The first task we’ll tackle is soldering pin headers onto your flight controller. On the SPRacingF3, like many flight controllers, some of the connections to be made use through-hole sockets, found which look similar to the image seen to the left. These small metal through-holes in your flight controller are designed to have what are called pin headers soldered to them, but can also have wires soldered directly through them. 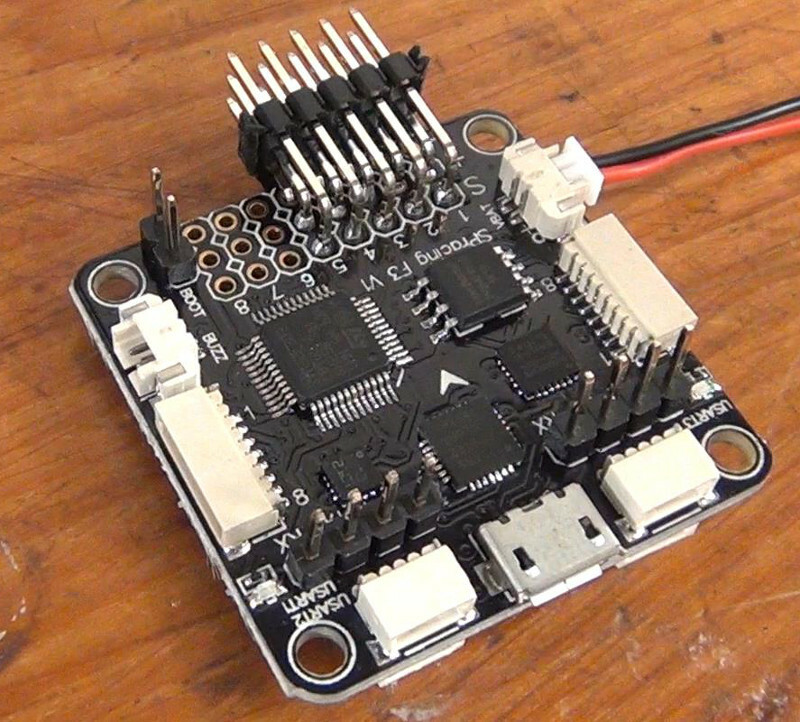 Soldering pin headers is very convenient in that it offers you the option of plugging and unplugging your ESCs using standard servo connectors. When done this way, your flight controller can be easily removed for service or replacement without even touching a soldering iron. The downside of this approach is that servo connectors and pin headers can take up a lot of space. 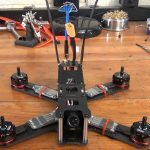 The other option is to solder your ESC wires directly to the flight controller board, which will result in a cleaner, lighter build that is very difficult to maintain. We recommend you use pin headers. The first thing you’ll need to do is decide what kind of pin header you will be using for your build. You have a two options when it comes to selecting pin headers. You can install a pin header with a 90 degree angle so that your ESC connectors extend horizontally from the front of the flight controller, or you can install straight pin headers which mean your connectors will extend straight up from the flight controller. 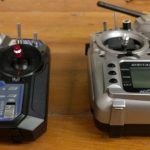 Which one you choose is ultimately up to how your quadcopter frame is configured. With the 90 degree pin headers, you need to make sure you have enough space to install your FPV camera, VTX and RC RX. With the straight pin headers, you need to make sure you have enough clearance between the top of the FC and the top plate of your frame. Try dry fitting both configurations before you decide to make sure you pick the right option. If this is your first time soldering pin headers onto a PCB, we recommend you try doing it on something cheap first rather than a flight controller. Check out our soldering guide for more information on this. For the ESC PWM connectors on our SPRacingF3 flight controller on this Lisam 210 build, we chose 90 degree pin headers, as you can see above. You’ll notice below that we installed headers on 5 of the PWM sockets, even though we are building a quadcopter that should only need 4. The reason for this is that we will be using the 5th socket to provide power to the flight controller. We’ll discuss this more in the next build section. 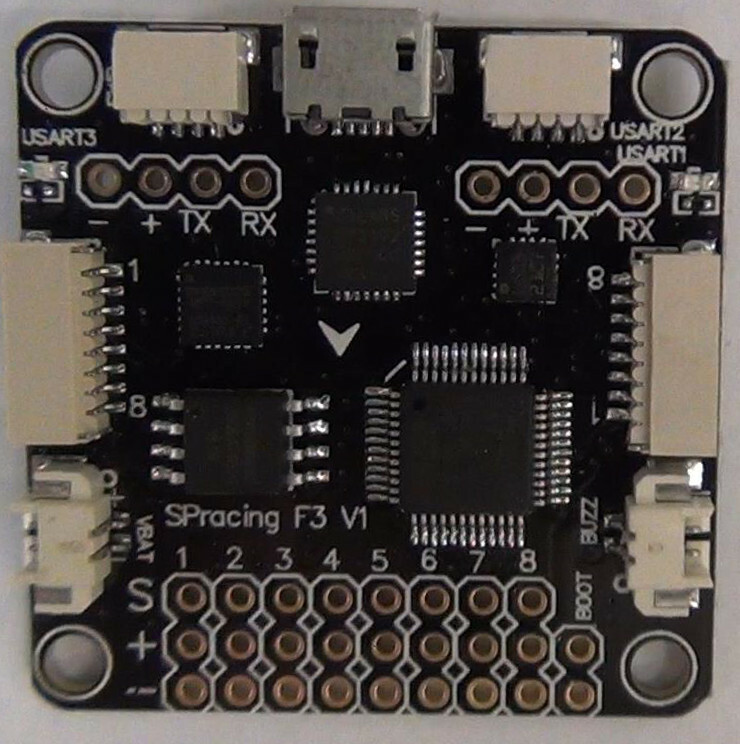 The SPRacingF3 also offers the option to install pin headers for 2 of the UARTs. These UARTs can also be accessed using the side connectors on the flight controller. Which one of these you use is entirely up to you – there is no wrong choice and both work well. For this build, we opted to install pin headers on the UART connection to the RC RX and simply installed pin headers on both of the UART slots. Here is our SPRacingF3 with all of the pin headers we will be using installed. Next, we’ll figure out is how to get power to the flight controller. 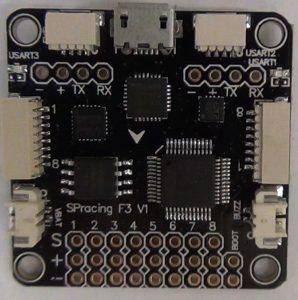 The SPRacingF3 requires that we provide 5V of power to any of it’s positive (+) voltage pins and battery ground to one of it’s ground (-) pins. To power the flight controller in this build, we will be hooking the 5v and ground wires to +/- slot on the 5th PWM pin header we installed. 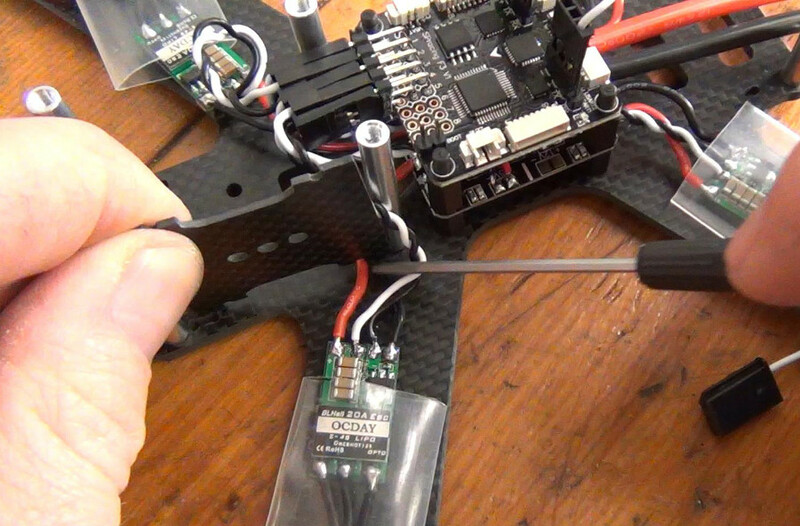 Like with the ESCs, this method of installation will make it easy to remove the flight controller for service. We will do this using a standard servo connector that is hard soldered to the PDB on the other side. After grabbing a spare servo connector, the first step is figuring out how long it will need to be before soldering the positive and negative wires onto the PDB. We laid the FC flat onto the PDB where it will be installed and measured out the length we needed to get the +/- wires between the two boards. A few extra centimeters were added to this length to make the wire easy to remove and give it some play. Next, the pigtail is soldered directly to the PDB. You’ll notice that we soldered the wire so that it points inward towards the PDB. This is because all of the space to the right and left of the PDB are “prop sweep zones” – areas where things will get hit by the props as they spin. When building up your wiring, you need to be extra careful not to let wires move into this area – whether by smart soldering or by using zip ties. 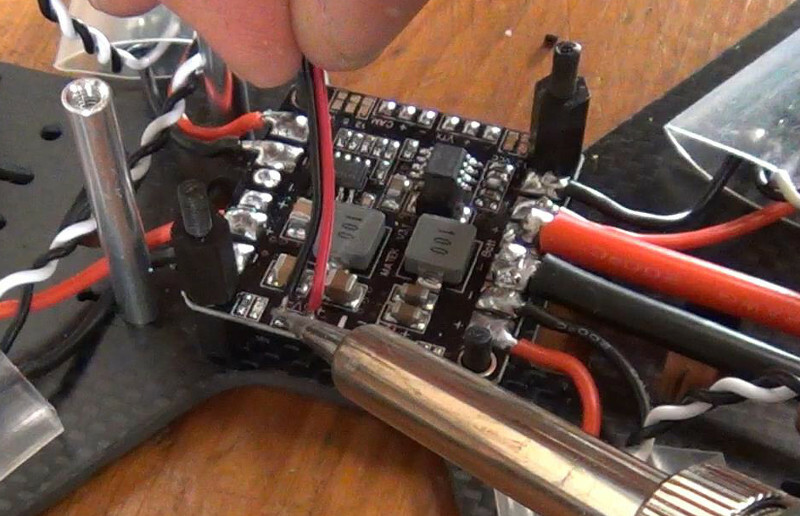 If you want to have battery voltage telemetry, you will need to solder another set of wires to your PDB – this time the wires will need to be soldered directly to the battery voltage pads and hooked into the “VBat” connection on the flight controller. If this is your first build, we recommend you omit this step and come back to do it later – keeping things as simple as possible until you are in the air is a great policy! Once the pin headers are installed on the SPRacingF3 – you are done with soldering. From this point on, you’ll just be working with wires you can freely plug and unplug. We like to install all of the wires first, then re-route and tie-wrap them to make a clean and secure quadcopter build. To do this right, we first need to mount our flight controller onto the quadcopter. When mounting your flight controller to your quadcopter frame, you must be absolutely certain it is oriented in the correct way. This ensures the gyro makes the right readings and sends the correct commands to fix any deviation of flight attitude. The correct direction of the flight controller is always shown with an arrow on the flight controller itself. The arrow will always point towards the front of the quadcopter. If for any reason you cannot install your flight controller with the arrow facing forwards, you can install it in another direction, and can configure your FC board orientation in software. Just be extremely careful if you do this – quadcopters with incorrect board orientations can very easily hurt you when armed. 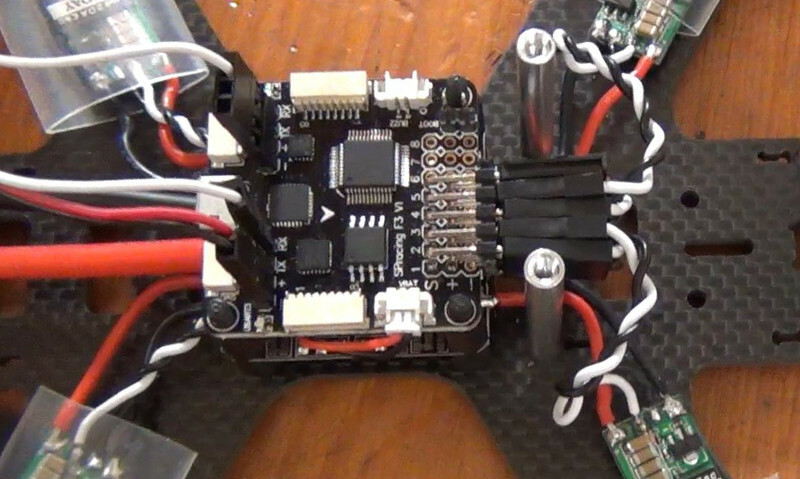 Once your flight controller is mounted, begin routing your wires to your quadcopter. 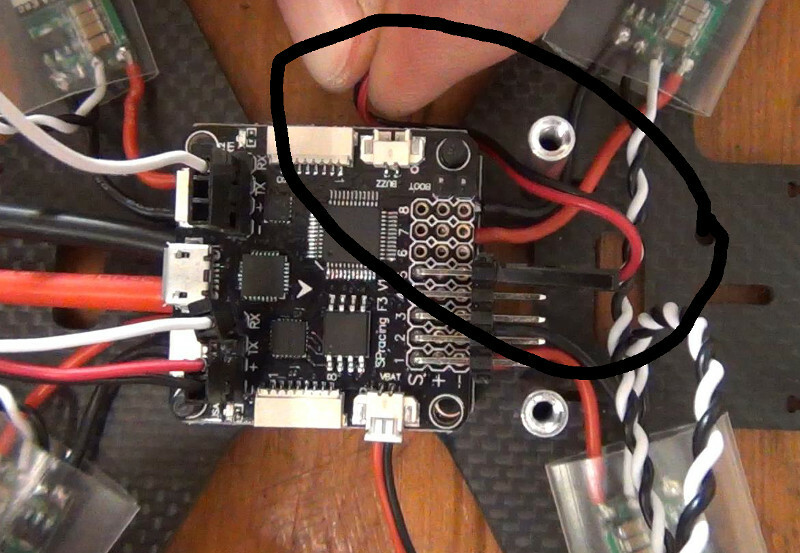 Your ESCs should be plugged into the labeled ports in a specific order, as denoted in the diagram to the left. E.g. the ESC on the bottom right arm of the quadcopter should be plugged into the first PWM slot, top right into the second, etc etc. When plugging in the ESC connectors, the white wire should be plugged into the “S” pin and the black should plug into the “-” pin. If there is a red wire coming from your ESC it should be removed. As we mentioned above, the SPRacingF3 flight controller can be powered by applying +5V to any of the “+” pins and battery ground to any of the “-” pins. For this build, we will be using the 5th PWM slot’s “+” and “-” pins to power the flight controller. This will be done simply by plugging the pigtail we soldered to the PDB into the flight controller. Like with the UARTs, there are many ways to power your flight controller – this just seemed to be the easiest and cleanest method for our build. If in doubt, check your flight controller’s manual. As you can see above, we routed the ESC wires underneath the flight controller. This holds them in place nicely and looks clean on this build. Notice also that we’ve plugged servo connectors into the UART connections on the board. The other end of these are brought to the rear of the quadcopter and will be installed in the RX in the next part of this series. One important final step to the wire installation is to fit up your FPV camera to make sure it fits in front of your flight controller and the installation does not bind up the tilting mechanism at all. As you can see in this picture, all the ESC wires need to be routed behind the silver aluminum standoff so that the camera mounting plates can be installed. Oops! At this point, your miniquad’s electronics are flight ready. However, before we take everything out to fly, we need to cleanup the build. Head on over to part 5 where we discuss securing and testing our components before plugging everything in!